According to the findings of a recent study by Transparency Market Research (TMR), the knee implant market in the U.S. highly consolidated among four players. The TMR report rates Zimmer Biomet Holdings Inc., Johnson & Johnson, Stryker Corp., and Smith & Nephew as the leaders in the U.S. knee implant market, collectively accounting for 80% of the shares in 2015. In current scenario, it the opportunities for new entrants is low, finding it difficult to compete with established layers and breakthrough products by the leading companies. Strict regulatory requirements and shortened product life cycle is further the restricting the opportunities for a new entrant. As per the evaluations provided in the TMR report, the knee implant market in the U.S. was worth US$4.3 bn in 2015, and expanding at a CAGR of 5.3% during the forecast period of 2016 to 2024, the valuation is projected to reach US$7.0 bn by 2024. Apart from technological advancement such as computer navigated surgeries, this industry witnessed several big mergers and acquisitions in 2015, such as Zimmer and Biomet joining hands in June while CMS launched three new mandatory bundled payment models for cardiac rehabilitation in December 2016. Together, these two factors are expected to have a defining effect on the knee implant market in the U.S.
Product-wise, the report segments the U.S. knee implant market into total knee replacement, partial knee replacement, and revision knee replacement. The segment of total knee replacement implant, which has been further sub-segmented into mobile bearing, fixed bearing, and medial pivot, accounted for the maximum demand revenue at US$3.0 bn in 2015 and is expected to remain most profitable in the near future with most impressive growth rate during the forecast period. Surging prevalence of chronic rheumatic conditions in the U.S. is driving the demand for total knee replacement segment in the country. 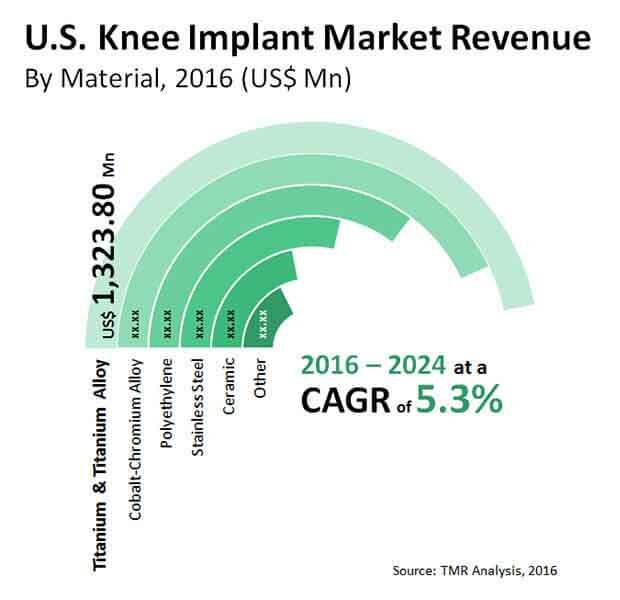 Material-wise, the U.S. knee implant market has been categorized into titanium and titanium alloys, stainless steel, cobalt-chromium alloys, ceramics, polyethylene, and others including tantalum, uncemented implants, and zirconium. Among these, titanium and titanium allows segment currently serves the maximum demand and is expected to remain most profitable throughout the forecast period. Geographically, the report studies the opportunities available for the players in the U.S. knee implant market in the regions of Pacific, Midwest, South Central, South Atlantic, Mountain, and Northeast. The report observes that Midwest region is highly saturated on the backdrop of presence of ASC units and rising adoption of new technologies. Growing elderly population, increasing incidence of injuries related to accidents, sports, and adventure, surging prevalence of chronic rheumatic conditions, escalating obese population, increased adoption of advanced knee products and procedures, and rising government initiatives for knee implant are some of the key factors driving the demand in the U.S. knee implant market. On the other hand, factors such as constricted regulations proposed by FDA on knee implant products, product recalls by FDA, and growing awareness of non-surgical alternative treatment are expected to challenge the market from attaining its full potential during the forecast period. Health care consolidation to increase customer base, acquisitions and partnerships for business development, and rising demand for ambulatory surgery centers are some of the trends noted by the report that augur well for the future of the market. In addition to that, custom-made products with additional product to increase implant attractiveness and high unmet needs in emerging economies are expected to open new opportunities for the players in the knee implant market in the U.S.